Looking for a change of pace from your regular breakfast? Break away from your boxed cereal and transform your morning meal into something truly unique. Combine yogurt and cereal in small bowl. 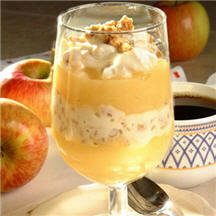 Spoon one-half package of escalloped apples into 4 dessert dishes; top with one-quarter of yogurt mixture.